For more information on the European system, see European Phased Adaptive Approach (EPAA) at a Glance. According to Missile Defense Agency (MDA) estimates, Congress has appropriated over $200 billion for the agency’s programs between fiscal years 1985 and 2019. That total does not include spending by the military services on programs such as the Patriot system or the many additional tens of billions of dollars spent since work on anti-missile systems first began in the 1950s. For nearly two decades, U.S. ballistic missile defense (BMD) policy has sought to protect the homeland against limited long-range missile strikes from states such as Iran and North Korea, but not major nuclear powers like Russia and China, because that mission would pose significant technical, financial, and geopolitical challenges. The United States has also pursued programs to defend U.S. troops and facilities abroad, and some close allies, from attacks by ballistic missiles—and to a much lesser extent cruise missiles. However, the U.S. pursuit of effective missile defenses has been accompanied by intense debate about the technical capabilities of the system and realism of testing, the scope of the ballistic missile threat, the deterrence and assurance benefits of defenses, the cost-effectiveness of shooting down relatively inexpensive offensive missiles with expensive defensive ones, and the repercussions for U.S. strategic stability with Russia and China. According to the Defense Department’s independent testing office, existing U.S. missile defenses have "demonstrated capability" to defend the U.S. homeland against a small number of intercontinental ballistic missile (ICBM) threats that employ "simple countermeasures." The testing office assesses that defenses to protect allies and U.S. troops deployed abroad possess only a “limited capability” to defend against small numbers of intermediate-range ballistic missiles (IRBMs) and medium-range ballistic missiles (MRBMs). The capability of defenses against short-range ballistic missiles is labeled as “fair.” Apart from the point-defense Patriot system, no systems in the U.S. BMD arsenal have been used in combat. Leaders of the U.S. missile defense enterprise have increasingly voiced concerns that the current U.S. approach to national and regional missile defense is unsustainable and that existing defenses must be augmented with emerging capabilities to reduce the cost of missile defense and keep pace with advancing adversary missile threats. Ballistic missile defense ranked high among the priorities of the George W. Bush administration, which withdrew the United States from the 1972 Anti-Ballistic Missile (ABM) Treaty in 2002 so that it could attempt to develop and deploy a nationwide defense against a limited number of long-range ballistic missiles. The United States had attempted to implement ground-based long-range ballistic missile defense only once before over the last 50 years. The first effort, Safeguard, was shut down within a few months of being declared operational in October 1975 because Congress concluded it was too expensive and ineffectual. Safeguard was allowed under the ABM Treaty since it was limited to no more than 100 interceptors protecting a single intercontinental ballistic missile (ICBM) base in North Dakota. Upon taking office in 2009, the Obama administration took steps to curtail the Bush administration’s rush to expand the U.S. homeland missile defense footprint and instead place greater emphasis on regional defense, particularly in Europe. The Obama administration decided to alter its predecessor’s plans for missile defense in Europe, announcing on Sept. 17, 2009, that the United States would adopt a European “Phased Adaptive Approach” to missile defense (EPAA). This approach primarily uses the Aegis Ballistic Missile Defense system to address the threat posed by short- and intermediate-range ballistic missiles from Iran. The Aegis system uses the Standard Missile-3 (SM-3) interceptors, which are deployed on Arleigh-Burke class destroyers in the Baltic Sea (Aegis Afloat), as well as on land in Romania and Poland (Aegis Ashore). President Obama's first Secretary of Defense, Robert Gates, also canceled a number of next generation programs, including two designed to intercept missiles during their boost phase, due to "escalating costs, operational problems, and technical challenges." However, while continuing to invest in regional defense, the Obama administration also made substantial investments in homeland defense largely in response to North Korea. The Ground-based Midcourse Defense (GMD) system comprises missile fields in Ft. Greely, Alaska, and Vandenberg Air Force Base, California, and is designed to protect the United States against limited, long-range missile strikes from North Korea and Iran. Despite concerns about the system’s technical viability, from 2013 to 2017, the Obama administration expanded the number of ground-based interceptors (GBIs) in these fields from 30 to 44. The administration also oversaw the deployment of additional regional missile interceptor and sensor capabilities to allies in Northeast Asia in response to North Korea, including the deployment of the terminal high-altitude area defense (THAAD) system to Guam and South Korea and two advanced radars to Japan. In May 2017, pursuant to direction from President Donald Trump and Congress, Defense Secretary James Mattis formally announced the beginning of the department’s Ballistic Missile Defense Review, which is taking a wide-ranging look at missile defense policy and strategy. The review was originally slated to be published alongside the Nuclear Posture Review in February 2018, but has been delayed. The reasons for the delay in the completion of the review are unclear. The Defense Department has stated that the review will focus on defense not only against ballistic missiles, but other missile threats as well, including hypersonic and cruise missiles. Since President Trump’s inauguration, the administration has vowed to expand national and regional missile defense systems of every kind and Congress has supported these efforts. In fiscal year 2018, Congress approved $11.5 billion for the Missile Defense Agency, an increase of $3.6 billion, or 46 percent, from the Trump administration’s May 2017 initial budget request. The appropriation is the largest Congress has ever provided for the agency after adjusting for inflation. The administration, with Congress’ support, is planning to expand the number of ground-based interceptors from 44 to 64 and purchasing additional regional missile defense interceptors. Congress approved another big increase for fiscal year 2019, approving $10.3 billion for the agency, an increase of $1.4 billion above the budget request of $9.9 billion. Ballistic missiles are powered by rockets initially but then follow an unpowered, parabolic trajectory toward their target. They are classified by the maximum distance that they can travel, which is a function of how powerful the missile’s engines (rockets) are and the weight of the missile’s warhead. To add more distance to a missile’s range, rockets are stacked on top of each other in a configuration referred to as staging. Short- and medium-range ballistic missiles are referred to as “theater” ballistic missiles, whereas ICBMs or long-range ballistic missiles are described as “strategic” ballistic missiles. The ABM Treaty had prohibited the development of large-scale, nationwide strategic defenses, but permitted development of theater missile defenses, as well as single-site strategic defenses. Begins at launch and lasts until the rocket engines stop firing and pushing the missile away from Earth. Depending on the missile, lasts between three and five minutes. Generally the missile is traveling relatively slowly, although toward the end of this stage an ICBM can reach speeds of more than 24,000 kilometers per hour. Most of this phase takes place in the atmosphere (endoatmospheric). Begins after the rockets finish firing and the missile is on a ballistic course toward its target. Longest stage of a missile’s flight, lasting up to 20 minutes for ICBMs. During the early part of the midcourse stage, the missile is still ascending toward its apogee, while during the latter part it is descending toward Earth. During this stage the missile’s warhead(s), as well as any decoys, separate from the delivery platform, or "bus." This phase takes place in space (exoatmospheric). Begins when the missile’s warhead re-enters the Earth’s atmosphere (endoatmospheric), and it continues until impact or detonation. This stage takes less than a minute for a strategic warhead, which can be traveling at speeds greater than 3,200 kilometers per hour. Cruise missiles and hypersonic missiles are two additional categories of missiles. Unlike ballistic missiles, cruise missiles remain within the atmosphere for the duration of their flight. Cruise missiles are propelled by jet engines and can be launched from land-, air-, or sea-based platforms. due to their constant propellants, they are more maneuverable than ballistic missiles, though they are also slower than their ballistic counterparts. Two types of hypersonic missiles are currently under development. A hypersonic boost-glide vehicle is fired by rockets into space and then released to fly to its target along the upper atmosphere. Unlike ballistic missiles, a boost-glide vehicle flies at a lower altitude and can change its intended target and trajectory repeatedly during its flight. The second type, a hypersonic cruise missile, is powered through its entire flight by advanced rockets or high-speed jet engines. It is a faster version of existing cruise missiles. The following charts provides a brief look at some of the major missile defense programs maintained by the United States. It contains information on what type of ballistic missile each defense would be intended to counter and at which stage of the enemy missile’s flight an attempted intercept would take place. Also included are Pentagon estimates on when each defense may have an initial, rudimentary capability as well as when it could be fully operational. Key element: ground-based missile interceptor consisting of a multistage booster and an exoatmospheric kill vehicle (EKV). EKV separates from the booster in space and seeks out its target through radar updates and use of its onboard visual and infrared sensors. The EKV destroys its target by colliding with it. This process is referred to as "hit-to-kill" or "kinetic kill." Goal: intercept strategic ballistic missile warheads in midcourse stage. As of the end of 2018, the total cost of the GMD system is estimated to be over $67 billion. MDA claims that the system has had ten successful intercepts in 18 tests. Only two of the past five intercept tests after 2008 has been successful. The first test of the GMD system against an ICBM-class target with simple countermeasures took place on May 30, 2017 and was deemed successful. The next test of the GMD system is scheduled for late 2018 and, for the first time, will involve firing two interceptors against one ICBM target. In a real-world scenario, multiple interceptors would be fired at an incoming missile. As of April 2018, the Pentagon deploys 44 ground-based interceptors (GBIs)–40 at Fort Greely, Alaska, and four at Vandenberg Air Force Base, California. Twenty of the 40 interceptors deployed in Alaska are armed with an older CE-1 kill vehicle that has not had a successful flight intercept test since 2008. In 2017 the Trump administration announced its plan to deploy twenty more GBIs, to be installed in a fourth missile field in Ft. Greely beginning in the FY 2021 timeframe. These interceptors will be armed with the new, under-development Redesigned Kill Vehicle (RKV), which is intended to enhance the performance of the current EKV. The development of the RKV is being accelerated to meet this deployment schedule. The interceptors are supported by land- and sea-based radars. Early Warning Radar units are being upgraded to support the system. As of June 2018, upgrades have been carried out at Beale Air Force Base, California and at Fylingdales, the United Kingdom, as well as Thule Air Force Base, Greenland and Clear, Alaska. The less powerful, westward-facing COBRA Dane radar on Shemya Island, in the Aleutian archipelago, was also upgraded in February 2010. Former MDA Director Adm. James Syring told a Senate panel in 2013 that the MDA tests the GMD system “in a controlled, scripted environment based on the amount of time and money each one of these tests costs.” This means there are limits to the realism of the test scenarios. MDA is investing in the Redesigned Kill Vehicle (RKV), which is intended to enhance the performance of the current EKV, which have been plagued by reliability problems. The RKV is expected to be deployed in 2022. In February and April 2016, the Government Accountability Office (GAO) assessed that MDA has not “demonstrated through flight testing that it can defend the U.S. homeland against the current missile defense threat.” It did not repeat this assessment in a May 2018 report, noting the success of a May 2017 test in intercepting an ICBM-class target. GAO also said that MDA is relying on “a highly optimistic, aggressive schedule” to upgrade the system “which has resulted in MDA: (1) accepting a proven risk of undue concurrency; (2) compromising interceptor reliability and extending risk to the warfighter; and (3) risking the efficacy of its planned flight tests in order to maintain schedule-driven deadlines necessary to meet its 2017 fielding deadline.” A May 2017 GAO report raised several red flags about the RKV program. For example, both U.S. Northern Command and U.S. Strategic Command are questioning whether the seeker planned for the kill vehicle will be able "to detect and track threats in an ICBM-range environment." Key elements include: the RIM-161 Standard Missile-3 (SM-3), RIM-174 Standard Missile-6 (SM-6), and the Aegis combat system. The SM-3 is a hit-to-kill missile comprised of a three-stage booster with a kill vehicle. There are three variations of the SM-3 missile: Block IA, Block IB, and Block IIA. Each variation will be deployed in different phases. The SM-6 is a hit-to-kill missile based on the SM-3 but offers extended range and firepower against cruise missile targets deep inland. The Navy’s component of the missile defense system, the Aegis system is central to the defense footprint in Asia and the Phased Adaptive Approach to missile defense in Europe. Aegis is a sea-based system, with missile launchers and radars mounted on cruisers and destroyers but is adaptable to land systems as well. Geared toward defending against short-, medium-, and intermediate-range ballistic missiles during their midcourse phase with an emphasis on the ascent stage. In 2005 the role of Aegis missile defense evolved from that of a forward sensor to include engagement capability. As of December 2018, the SM-3 has a test record of 40 intercepts in 49 attempts, comprising both the SM-3 and SM-6 missiles. Japan’s four KONGO Class Destroyers have been upgraded with BMD capabilities. Japan and the United States are co-developing the SM-3 block IIA. Under the FY19 budget submission, by the end of FY2019, there are scheduled to be 41 Aegis BMD ships, and by the end of FY2023, there are scheduled to be 57 Aegis BMD ships. As of October 2017, thirty-three ships are currently deployed. Of these, 17 are assigned to the Pacific Fleet and 16 to the Atlantic Fleet. A land-based SM-3 block IB deployment occurred in Romania in 2016, the same year ground was broken in Poland on a site to house land-based SM-3 IIAs. The Polish site was originally scheduled to become operational in 2018, but has been delayed until 2020. The first intercept test of the new SM-3 IIA interceptor occurred in February 2017 and was successful. However, the second and third intercept tests of the missile in June 2017 and January 2018 failed to destroy their targets. There were two more tests before the end of 2018 on Oct. 26 and Dec. 11, both successful, with the December test particularly notable for being the first successful intercept of an IRBM target and using the ability to "engage on remote" using a forward-based sensor. Key elements include: 1) an interceptor missile comprising a single rocket booster with a separating kill-vehicle, 2) an advanced AN/TPY-2 radar unit to identify and discriminate between incoming missiles, and 3) an infrared seeker to home in on its target. The THAAD kill vehicle relies on hit-to-kill kinetic interception. THAAD batteries have four components: launcher, interceptors, radar, and fire control. Each battery can carry 48-72 interceptors (there are eight interceptors per launcher and typically each battery is believed to contain six to nine launch vehicles). THAAD’s mission is to intercept short- and medium-range ballistic missiles at the end of their midcourse stage and in the terminal stage. Intercepts could take place inside or outside the atmosphere. On July 11, 2017, the U.S. Missile Defense Agency executed a successful intercept test of the THAAD system against an air-launched intermediate-range ballistic missile (IRBM) target. The test was the first against an IRBM-class target. The U.S. Army operates six THAAD batteries, each with its own AN/TPY-2 radar. Three batteries, each comprising six launchers, are deployed in the Pacific: one in South Korea, one in Guam, and one in Hawaii. Production of the first THAAD interceptors began in March 2011. The Army will field 210 THAAD interceptors by September 2018, the Missile Defense Agency told Congress in June 2017, and the President requested funding for 82 additional interceptors to be built in 2019. In May 2018, GAO reported that THAAD interceptor production had been delayed, and it only delivered 41 of the planned 61 interceptors in FY2017. MDA is exploring development of an upgraded version of THAAD known as THAAD extended range, which is designed to counter ultrafast gliding weapons. The U.S. and South Korea decided in July 2016 to deploy a THAAD battery in South Korea to counter North Korean threats despite strong objections from China. The battery began operating in April 2017. 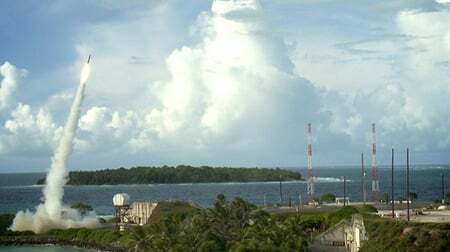 A THAAD battery was deployed to Guam in 2013 to counter potential North Korea IRBM threats to the island and U.S. military assets there. The first test of the THAAD system against an IRBM target occurred in July 2017. Key elements include: a one-piece, hit-to-kill missile interceptor fired from a mobile launching station, which carries 16 PAC-3 missiles. A blast fragmentation warhead kills the target. PAC-3s destroyed two Iraqi short-range ballistic missiles during the 2003 conflict and shot down a U.S. fighter jet. Earlier Patriot models also deployed to the region shot down nine Iraqi missiles and a British combat aircraft. PAC-3 is now considered operational and has been deployed to several countries including Bahrain, Egypt, Germany, Greece, Israel, Japan, Jordan, Kuwait, the Netherlands, Saudi Arabia, South Korea, Spain, Taiwan, and the UAE. Key Elements: 1) geosynchronous (GEO) satellites orbiting the earth; 2) sensors on host satellites in highly elliptical earth orbit (HEO). Primary objective is to provide early warning of theater and strategic missile launches. Provides data for technical intelligence and battle space awareness. Currently there are three SBIRS sensors mounted on host satellites in highly elliptical orbit (HEO-1, HEO-2, and HEO-3). There are four SBIRS satellites in geosynchronous orbit. GEO-1 was launched in May 2011, GEO-2 in March 2013, GEO-3 in January 2017, and GEO-4 in January 2018. As of March 2018, the program is projected to cost $19.6 billion for six satellites—four times greater than its initial estimated $5 billion for five satellites. The first sensor in highly elliptical orbit—HEO-1—was certified for operations by U.S. Strategic Command in December 2008. The most recent sensor, GEO-4, was launched aboard an Atlas V rocket on January 19, 2018. Lockheed Martin is under contract to produce GEO-5 and GEO-6, which will be launched in 2021 and 2022, respectively. SBIRS originally called for two additional sensors, GEO-7 and GEO-8, but these were scrapped in favor of pursuing an entirely new SBIRS follow-on program. The successor program has yet to be identified or developed. Air Force Secretary Heather Wilson suggested the new system will be "simpler" and more survivable to enemy attacks. A number of high-profile missile defense efforts that began during the George W. Bush administration were canceled by President Bush’s last Defense Secretary, Robert Gates. Below is a summary of some of these programs, the reason they were canceled, and the amount of money that was spent to develop them. The program was a planned network of 9-12 satellites which were expected to support U.S. missile defense systems by providing tracking data from space on missiles during their entire flight. As reported by the LA Times, outside experts found that the satellites would not have been able to detect warheads flying over the arctic. In order to provide continuous tracking of the missiles, MDA would have actually needed at least 24 satellites. An independent cost assessment projected the total cost of the system to be $24 billion over 20 years instead of the $10 billion MDA projected. The original program included a modified Boeing 747 plane equipped with a chemical oxygen-iodine laser (COIL) and two tracking lasers. The laser beam would be produced by a chemical reaction. The objective was to shoot down ballistic missiles during their boost phase right after launch but the system could also be used for other missions. The laser would have had a limited range which meant the 747 would have been vulnerable to anti-aircraft missiles. To increase the range, the laser would have needed to be 20-30 times more powerful than planned. KEI was to be comprised of three powerful boosters and a separating kill vehicle. The booster was expected to travel at least six kilometers per second, which is comparable to an ICBM. The kill vehicle was not designed to carry an explosive warhead but to destroy its target through the force of a collision. In order to carry the KEI, Navy ships would have needed to be retrofitted. The range was not great enough to be land-based. The program was designed to launch multiple kill vehicles from a single booster in order to increase the odds of destroying an incoming missile. It was designed to destroy both missiles and decoys. The Missile Defense Agency is focusing its newest efforts to ensure the system stays ahead of developing foreign missile threats (see the below chart). Some of the advanced anti-missile technologies the Defense Department is pursuing, such as airborne lasers to zap missiles in the early stages of their flight, have been unsuccessfully pursued in the past. Three defense contractors (Boeing, Lockheed Martin, and Raytheon) have been awarded contracts to develop concepts to deploy multiple kill vehicles from one booster in order to destroy decoys and multiple warheads ejected from ICBMs. MDA hopes to begin a full development program by FY 2022. MDA is recommitting to research to determine how to develop laser beams that could destroy missiles in their boost phase. Inspired by the ABL program, the vision for the new system is to mate a powerful solid-state laser to drones. MDA aims to develop a laser demonstrator by 2020 or 2021 and a deployed capability by 2025. Left of launch is a proposed strategy that would be designed to counter missile threats before the missile is launched so as to reduce the need for expensive anti-missile interceptors to attempt to shoot down the missile. Tactically, the strategy would likely include the of cyber-attacks and electronic warfare to achieve this goal. Despite much speculation in the press about the U.S. ability to hack North Korean missile tests, the data shows that North Korea’s missile tests are succeeding at a high rate and that the failures are concentrated in new systems that had not been previously tested. The Space Tracking and Surveillance System (STSS) is an experimental component of the U.S. ballistic missile defense architecture designed to detect and track ballistic missiles in all three phases of flight. The nascent STSS constellation orbits at 1,350km and aims to provide “launch on remote” capability—the ability to fire an interceptor before the target comes into view of a radar unit. In 2011, STSS-D demonstrated the first space-based birth-to-death tracking of a missile target. In August 2018, MDA Director Samuel Greaves described what the agency envisages for a future more comprehensive space sensor layer. Such a layer could look like the Air Force’s Overhead Persistent Infrared Global Scanning system, and could have a regional detection and tracking capability staring down at Earth that could go after targets that are currently harder to detect or in low earth orbit, such as hypersonic missiles, and could catch missiles in the boost or burnout phases of flight. The sensor could also cover the midcourse portion of a missile’s flight by looking against the background of space and discriminate, track, and eventually send data directly to the ballistic missile defense weapon system for fire control. Finally, the sensor could also record towards the end of a missile’s trajectory whether an intercept against a target occurred or was missed. In recent years Congress has sought to encourage the Obama administration to expand the U.S. ballistic missile defense effort in the face of advancing adversary ballistic missile capabilities. These initiatives, which are summarized below, have been met with strong resistance from the administration. In the fiscal year 2013 National Defense Authorization Act, Congress required the Defense Department to conduct a study to evaluate at least three possible new long-range interceptor sites that could augment the GMD system, including at least two on the East Coast. The Defense Department announced in May 2016 that it completed a draft study of three possible locations in the eastern United States for a new ballistic missile defense interceptor site, but said it had no plans to actually build such a site. The three sites are: Ft. Drum, New York; Camp Ravenna, Ohio; or Ft. Custer, Michigan. The draft environmental impact statement, which was posted on the website of the Missile Defense Agency (MDA) May 31, 2016, said that the Defense Department “does not propose and has not made a decision to deploy or construct an additional interceptor site.” The Trump administration will make a decision on whether to proceed with a third site in the MDR. The FY 2017 National Defense Authorization Act allows the Pentagon to begin design, research and development, and testing for a space-based missile defense system. The Obama administration argued that there is no requirement for a space-based intercept system and there are perennial concerns about the technical feasibility and strategic limitations of interceptors in space. However, in the 2018 National Defense Authorization Act (NDAA), Congress authorized the construction of a space-based interceptor layer, should the Missile Defense Agency deem such a system appropriate. In February 2018, Senator Ted Cruz called for funding a layer of space-based interceptors (SBI). In his testimony before the defense subcommittee of the Senate Appropriations Committee in April 2018, MDA Director Samuel Greaves said that the agency has begun “prototype design for a potential space-based missile defense architecture.” In the FY2019 National Defense Authorization Act, Congress voted to require the Defense Department to develop a space-based ballistic missile defense interceptor layer, regardless of whether the Missile Defense Review recommends such interceptors. The FY 2017 National Defense Authorization Act (NDAA) revised the 1999 National Missile Defense Act to remove the world “limited,” and the 2018 NDAA authorized expansions in the national missile defense program. Proponents of the change argue that the 1999 legislation has prevented the Defense Department from adequately planning for the protection of the U.S. homeland from the full spectrum of ballistic missiles threats, including threats posed by Russia and China. The Obama administration strongly objected to the change, stating that the word “limited” is specifically intended to convey that the U.S. homeland missile defense system is designed and deployed to counter limited attacks (in number and sophistication) from Iran and North Korea, and not to counter the strategic deterrence forces of Russia and China.